The U.S. Department of Justice is willing to temper the proposed remedies in its e-book price-fixing case against Apple, but not all that much. On Friday, the DOJ submitted a revision of its proposed injunction, dialing it back slightly in order to limit the possibility that changes in the publishing and technology industries might cause it to “outlive its usefulness and unnecessarily harm Apple.” Under the terms of the revised proposal, the length of the injunction will be shortened to five years from 10, and the restrictions placed on deals Apple can strike with publishers will stand for two to four years, rather than five. Hardly the significant adjustments for which Apple has been angling, slagging the remedies variously as “draconian,” “intrusive,” and “wildly out of proportion to any adjudicated wrongdoing or potential harm.” But the DOJ is clearly unwilling to back down from what it feels are necessary and justified sanctions against a player it feels can’t be trusted. In its latest filing, the DOJ said that the remedy adjustments Apple proposed “imposed virtually no limitations” on its conduct, beyond those established by the DOJ’s earlier settlements with the publishers involved in the case. Apple declined comment on the DOJ’s updated remedies. 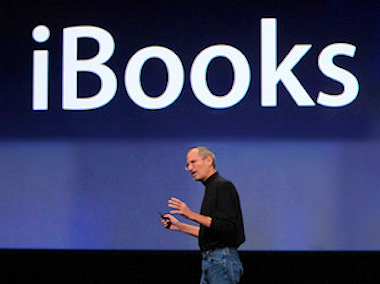 Is Steve Jobs Message a Smoking Gun in Apple E-Book Case?